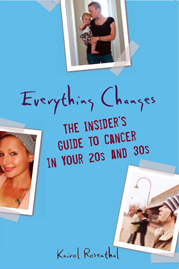 While writing my book Everything Changes, I met with patients on the fringe of death and those for whom cancer was a horrible incident from which they would fully recover. Regardless of the gravity of their illness, many young cancer patients think about end-of-life issues. When friends and family are rooting for your health and thinking positively, it can be really challenging finding someone willing to listen to your needs and desires around complex medical decisions, end-of-life care, and how you want to be remembered after you are gone. That’s why I was thrilled to discover Voicing My Choices: A Planning Guide for Adolescents and Young Adults. Having a document which brings up these issues in non-threatening language can really help steer the conversation. And many parts of this guide become legally binding advanced directives too. Some people find grim and scary the topic of end-of-life planning. Others find it a relief to talk and plan practically for the inevitable. Whether it is three years or sixty years from now, the bottom-line that my husband loves to joke about is that none of us are getting out of here alive! So why not at least be prepared?